Due to the En Ka Fair being held at the Jenks lot and high school lot, Skillings Road will be closed this week. One lane of traffic will be open for access to the high school until after school on Friday May 20. After 2:30 PM on the 20th, Skillings Road will be completely closed until approximately 1:00 AM on Sunday, 22. 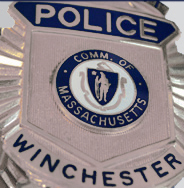 We have added a small photo album of the Winchester Police Department. Photos will be periodically added to the album. You will be able to view the album any time by visiting the Photo Album link under About.